The Grammy award-winning Harlem Quartet begin their three-year Royal College of Music residency with a week of events and coaching sessions from 8–14 May. 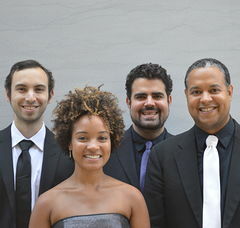 Since its public debut in 2006 at Carnegie Hall, the Harlem Quartet has performed throughout the US and the world. Praised for its “panache” by The New York Times, the quartet’s mission is to advance diversity in classical music, engaging young and new audiences through the discovery and presentation of varied repertoire that includes works by minority composers. The New York-based ensemble is renowned for their genre-crossing approach, which will be showcased in their first performance at the RCM on Wednesday 10 May, featuring a selection of arrangements of jazz standards by composers including Dizzy Gillespie and Chick Corea alongside the last of Beethoven’s Rasumovsky quartets. On 14 May the group will be special guests in the RCM’s annual Super String Sunday – a free all-day festival of string music, broadcast live at www.rcm.ac.uk/live – and in a special concert celebrating the 80thbirthday of acclaimed RCM harp professor Marisa Robles. As part of their residency the group will also offer up an open rehearsal for RCM students, and pass on their knowledge to the next generation of performers in coaching sessions with musicians from both the Royal College of Music and the RCM Junior Department.